Flipkart special offer to buy Selfie stick with bluetooth remote in just 299 Rs cheap price in india of Fotonica brand, ideal for taking selfies from phone or camera. 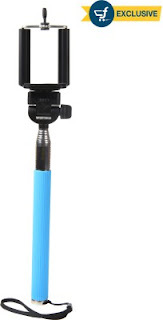 Market price for this Selfie stick is 1200 Rs online, but only for a very limited time, you can buy it in just 299 Rs. How to Use the Selfie Stick with inbuilt Bluetooth? For more awesome deals and Discount offer, stay along with All india coupons.